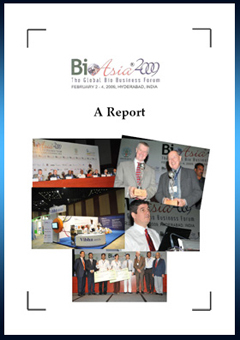 BioAsia 2009, the sixth edition of the annual biotechnology conference, held at Hyderabad from 2-4th February, 2009, was a successful event with a large participation from key global players in Biotech/ Biopharma/Medical/ BioAgri sectors across the world. It was inaugurated by the Hon'ble Chief Minister of Andhra Pradesh, Dr. Y S Rajasekhara Reddy. BioAsia 2009 witnessed the presence of two overseas Ministers Viz. Sri Lanka & Spain and the British High Commissioner along with participation of 20 Countries despite the global economic meltdown with about 91 overseas delegates including 25 US and 18 Iranian Delegations and Global Biopharma and Biotech Majors/ MNCs Viz. Pfizer (USA), Lonza (Switzerland), Genentech (USA), Merck & Co. (USA), Actelion (Switzerland), Avesthagen (India), Biocon (India) and many more. 280 private B2B meetings were realized during the three days event which had two tracks and 17 sessions with 72 speakers/ panelists along with parallel agri sessions on all the three days with about 25 speakers in 8 sessions. Besides, a Memorandum of Understanding was signed between BioCat (Spain), Federation of Asian Biotech Associations (Hyderabad) and Andhra Pradesh Industrial Infrastructure Corporation (Hyderabad) for cooperation in various areas of Biotech/ Biopharma space. The BioAsia 2009 Genome Valley Excellence Award was presented to Prof. Marc Van Montagu, President of European Federation of Biotechnology and Dr. Martin Mackay, President of R&D of Astra Zeneca Pharmaceuticals for their outstanding contributions to Biotechnology. BioAsia Innovation Award consisting of INR One Lac and a citation was awarded to Dr. Sunil Kumar Verma from CCMB and BioAsia Young Minds Award consisting of INR 50, 000 and a citation was awarded to Ms. Abinaya from Sri Sankara Sr. School from Chennai.